1. No bounty hunters from the same franchise. That means you cant have both Jango and Boba Fett, since they're both from Star Wars. This goes for all franchises. 2. Each bounty hunter must be a playable character from at least 1 video game. For example, you cannot pick Psy Crow from Earthworm Jim because he's not playable. 3.You must provide any pic you can of the hunter. Other than that pick whoever you like, any franchise. I have the demo, "First Hunt," but I have played the final version. Is this the hunter you were referring to? You like Bossk more than Boba Fett?? 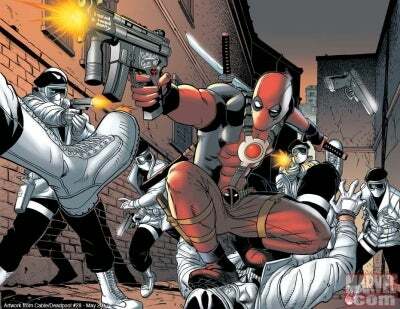 Oh and fett3393 Deadpool is actually a Mercenary (merc with a mouth) but at times he can be considered a bounty hunter. I agree with you, Fett3393, Deadpool is great. Dengar, however, is from the same franchise as Boba Fett. If Deadpool can be considered a bounty hunter, I'll include him also. oops! I forgot that rule. Draco, could you tell us more about that hunter you mentioned, The Grave? yeah, who is he? he looks pretty deadly to me. Sorry it's just that I think it would be better if there was more variety among the hunters we selected. I didn't think it would be very interesting if we saw the same old hunters from Star Wars over and over again. By the way, that thing on Brandon ( The Grave) 's back is a coffin. It shoots either a machine gun or rockets. Interestingly, there was a character in Red Dead Revolver who also carried a coffin on his back, concealing a machine gun.His name was Mr.Black. He was defeated by Red. The coffin idea came from the Western movie D'jango, which is supposedly Lucas got the name for Jango. Check Wikipedia for information about Gungrave. I have found that specific information to be truthful. This is slightly off topic but if you notice, I keep changing my top bounty hunter from Boba to Jango. here is my conflict. I change it to Boba because his shoes more closely resemble my converse than Jango's shoes. But then I think about how irresistable it is to wield pistols. But then I remember my converse again, and so on. But then I think about how Boba is more important to the story. But then I think that Jango is the "fett" of "my time" so it goes back. But then I like Jango even more because he has a game all about him, star wars bounty hunter. then i start missing boba. while Boba listens to his iPod. God, someone here please help me get over this question: Which Fett do I like better, Boba or Jango? I'm sure you know my answer, but I suggest Boba. He is more feared than Jango ever was. 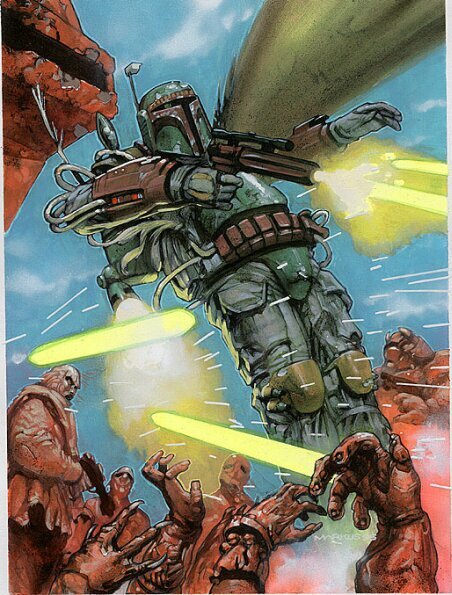 It looks like Boba's blaster is more powerful. Boba is nigh-completely emotionless. Well, Boba's the better hunter, to be sure. But I still love Jango- he was by far the better Mandalorian. question: Which Fett do I like better, Boba or Jango? Wow... I am laughing so hard at that question. Thats not what I meant... I have no problem with you liking Jango over Boba. I was laughing at the fact that you asked US, which Fett YOU like better.